Active Gourmet Holidays brings you an incredible cooking vacation in the southwest of France. You will take cooking classes with a native French chef. 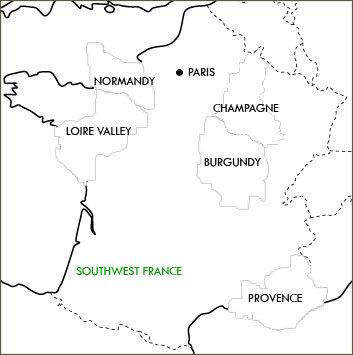 Through artisan and market visits you will explore the Périgord region of France known for its cuisine, wine and truffles. You will be taken to see ancient cave dwellings dating from 20,000 B.C. and you will explore medieval villages. And if that is not enough, you will have the unique experience of staying in an authentic fortified medieval castle. 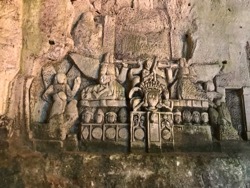 And of course since this is a culinary extravaganza, you will dine on delectable cuisine and fine regional wines in the same space where knights, lords and maidens broke bread and shared meals together. This is an experience not to be missed! Chateau Marouatte is a stunning 14th Century fortified castle steeped in history and now fully restored as an amazing family home. Perched on a hill in the Green Périgord, a short distance from Périgueux, Marouatte enjoys spectacular panoramic views over the surrounding countryside. This majestic environment is the perfect setting for creativity, inspiration and relaxation. Marouatte hosts many creative retreats throughout the year -- writing or song writing. With the wealth of produce available, creating a culinary retreat was a natural next step. Experience a 5 day/6 night immersion in the very best Périgord has to offer. You will travel through some of the most picturesque ancient towns and discover the rich cultural history of the area. 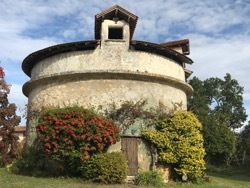 You will meet artisan producers of walnut oil and cheese makers, sample the rustic traditional charcuterie and cheeses, and enjoy comparative tastings of truffles and caviar. You will dine at several venues from casual bistros favored by the locals, to a Michelin-star restaurant. 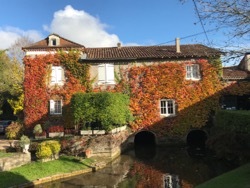 Along the way, you will become an astute wine connoisseur with daily wine tastings of several appellations of Southwest France, and get first-hand knowledge of the region’s cuisine through hands-on cooking classes. This culinary retreat at Marouatte Castle is designed to take advantage of the seasonal produce the region is best known for: foie gras, fatted ducks, truffles, walnuts, wild mushrooms, chestnuts, etc. 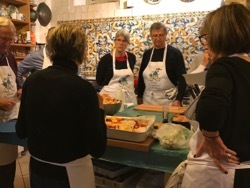 In your cooking classes, you will learn traditional recipes such as walnut cake, emblematic hearty soups, the famous sauce Périgueux, robust stews redolent with wild mushrooms, to name a few. Classes will also offer inventive, somewhat lighter fare like salad Périgourdine, local trout with walnuts and wild mushrooms, duck magret, walnuts and prune parfait. 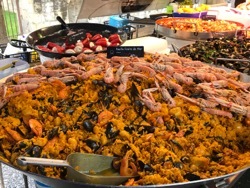 In between the cooking workshops and market visits, there will be shopping trips to local boutiques and antique stores, and visits to medieval villages and castles. Your chef for the week is Anne de Ravel. Anne was an independent writer, producer and cookbook author in New York specializing in lifestyle, culinary trends and cooking. She was a creative editor for the New York Times, Entertaining Magazine and a producer for the Food Network. Upon returning to her native France, she created Saveur Languedoc, oeno-culinary programs that bring people together to discover Languedoc, its culinary heritage and wines. In addition, she was the original chef at the Chateau Les Carrasses in Quarante (34) where she received many accolades. Anne travels extensively through France in search of the best ingredients and recipes and Périgord is one of her favorite destinations. 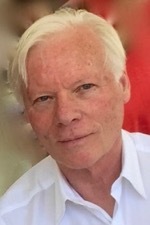 Your host for the week is Miles Copeland, owner of Marouatte and well known in the music business as the founder of IRS Records (REM, Go Gos, Fine Young Cannibals etc), long time manager of the Police, Sting, the Bangles and many others. Miles' father was a founding member of the CIA and his mother was a respected prehistorian, which resulted in an early upbringing in Egypt, Syria, and Lebanon. Growing up visiting crusader castles and ancient sites fostered in Miles an appreciation for history and the past. 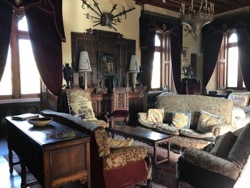 Acquiring Marouatte 28 years ago, the castle has been a great excuse to collect and decorate in medieval style with antiques, stained glass, tapestries, even suits of armor, yet with modern amenities and a home like ambiance. Meanwhile, as a genuine medieval castle, it was not hard to maintain its stately mystique. Invited musicians and songwriters over the past 25 years have created a prestigious legacy of hits created at and inspired by the castle. We hope to see this legacy expanded into other creative arts. You will be picked up at the Angoulême train station in the afternoon. Note: there will be only one group transfer from the train station on arrival and departure day. 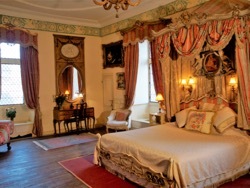 Tour of the chateau and settle into your rooms before meeting for a welcome aperitif. Dinner will be prepared by the chef. 9 AM. Breakfast, Continental and/or American, depending on each guest's request at time of booking. 9:30 AM. First cooking workshop. We will prepare a three course meal to be enjoyed later in the evening. 2:30 PM. 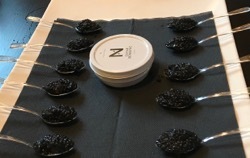 Visit of the Neuvic sturgeon and caviar producing farm. You will enjoy a tour of the farm, discover how the sturgeons are raised and learn about the different grades of caviar, and how they are processed, followed by a comprehensive tasting. 8 PM. Sit-down dinner prepared in the morning. 9:30 AM. You will spend the morning discovering the Périgueux's market spread through the historical center of the town. As you browse through the stalls of local producers of honey, walnuts, vegetables, ducks and truffles to name a few, you will enjoy the Medieval and Renaissance architecture remarkably preserved. You will also be able to explore the many chic boutiques, antique stores and artisanal shops. 4 PM. Cooking class of the day. We will prepare a three course meal for our evening meal as well as a few appetizers for the wine tasting. 9:30 AM. You will meet Claire Martin de Foresta, our truffle expert, for the introduction of the workshop of the day. 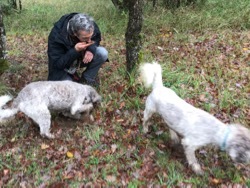 You will then follow her dogs for a truffle hunt on the grounds of the property. While walking through the woods, you will learn how truffles grow in the wild, the type of soil needed depending on the species, and how to cultivate them. Be prepared to come back empty handed, truffles have way of hiding themselves from even the best trained dog! 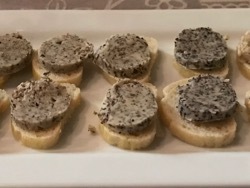 Back at the chateau, you will be introduced to all the truffles available throughout the year and learn what you should be looking for when purchasing this delicacy. 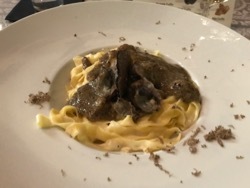 You will have the opportunity to sample different types of truffles and find out their seasons and origins. You will then follow the cooking demonstration while Claire prepares a 4-course lunch, including dessert. 9:30. Today’s excursion will take you to the charming town of Brantôme, nicknamed the Venice of the Dordogne, where you will peruse the weekly market, explore the small artisanal boutiques and visit the Benedictine Abbey built by Charlemagne in 769, an elegant building hiding its troglodyte origins that includes the famous cave of the 'Last Judgment'. 12:30 PM. Lunch in Neuvic. 10 AM. Visit of the Grotte de Villars, an impressive site. 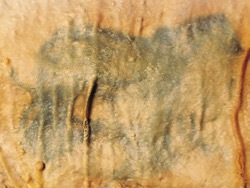 It is mostly a natural cave full of stalactites and stalagmites but also has a few small prehistoric drawings. We hope you have enjoyed your castle cooking vacation! A minimum of 6 participants is required to run this tour and the tour is limited to a maximum of 20 total participants. However, the cooking participants are limited to 10. Guests will be collected from Angoulême Train Station in the late afternoon (time to be determined but around 5pm). There may be only one transfer from the train station to the castle but if you happen to miss the transfer we can pick you up for an additional charge of 70€. 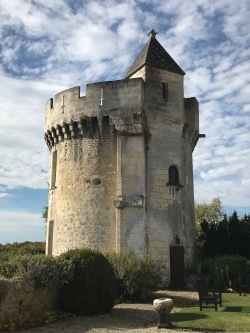 If you are flying into Paris and would like to come directly to the castle, you can take the TGV (high speed) train from Charles de Gaulle Airport (just under a 3 hour train ride to Angoulême). If you wish to stay in Paris for a night or two before coming to the castle, you can take the TGV from Montparnasse (just under a 2 hour train ride to Angoulême). We will help with suggestions on train arrival and departure times once all guests are confirmed for the week. *Non cooking participants are welcome to join in all of the meals and all of the excursions. After availability is confirmed, a 30% non-refundable deposit per person and the completed and submitted registration form will secure your reservation. Final payment is due no later than 75 days before your arrival date. "What can I say? This was an incredible week of touring, cooking, eating and wine tasting in a most interesting part of France. And the icing on the "gateau" was the history of rock and roll in which our host, Miles Copeland, played a huge part.This trip was so cool! We were kept informed about everything we would be doing and everything that we did lived up to my expectations, if not surpassing them. I thought the excursions were great. Interesting and managed to convey the feeling of the area." "We had a wonderful and unique experience Cooking in the Castle and one we would highly recommend. We felt as if the Castle was ours for the week and an informal friendly atmosphere was created by the hosts and fellow guests. We were introduced to all the exotic foods of the region by visits to centres of excellence and tastings, our palates will never be the same! 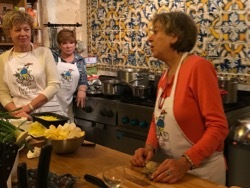 Our cooking classes were relaxed and great fun and we learnt a lot about the great foods of the Dordogne region. The Truffle day was a standout experience. Many thanks to AGH who maintains the highest of standards." 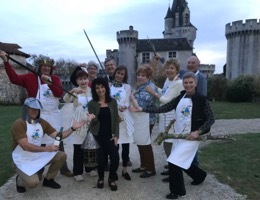 "A wonderful balance of a medieval castle and French cooking. Your imagination can run wild." "We thoroughly enjoyed our time at the castle. The food, wine, ambiance were amazing. We treasure the memories we have from the trips we have taken with you!" 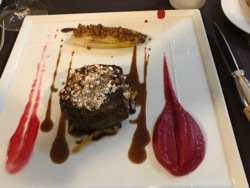 "We enjoyed the unique experience of staying in a castle and learning more about French cooking particular to the region." "Great experience at the castle. I loved working with the chef and learning traditional French cooking techniques. Staying at the castle and exploring the small businesses was enlightening. I will always remember the passion and dedication of the people I met."